unicorn In world mythology and folklore, a fantastic animal usually portrayed as a small horselike creature with a single horn protruding from its head. 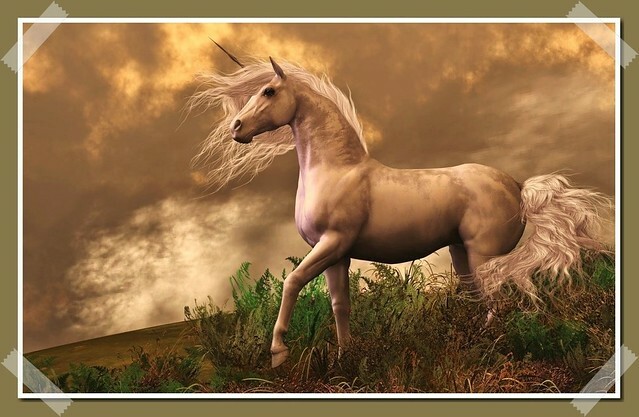 In European mythologies the unicorn is usually viewed as a beneficent being. A medieval description of the fantastic animal is found in Le Bestiaire Divin de Guillaume Clerc de Normandie. The Unicorn has but one horn in the middle of its forehead. It is the only animal that ventures to attack the elephant; and so sharp is the nail of its foot, that with one blow it can rip the belly out of that beast. Hunters can catch the unicorn only by placing a young virgin in his haunts. No sooner does he see the damsel, than he runs towards her, and lies down at her feet, and so suffers himself to be captured by the hunters. The unicorn represents Jesus Christ, who took on Him our nature in the Virgin’s womb. . . . Its one horn signifies the Gospel of Truth. The Revised Standard Version of the Bible in its translation of the verse substitutes “wild ox” for unicorn. One medieval Jewish folktale said the unicorn had perished in Noah’s flood because it was too large to enter the ark. Another Jewish folktale argued that God never destroys his own creation; if the unicorn was too large to get into the ark, then God would have let it swim behind the ark. Along with the unicorn as a beneficent symbol, such as Jesus Christ, the animal was also identified with evil and death. In The Golden Legend, a series of saints’ lives by Jacobus de Voragine written in the 13th century, the “unicorn is the figure of Death, which continually followeth man and desireth to seize him.” Death rides a unicorn in some late medieval Books of Hours. In the Ancrene Riwle, a 12th-century book of rules for nuns, the unicorn appears as a symbol of wrath, along with the lion for pride, the serpent for envy, and the bear for sloth. The Church Fathers at the Council of Trent, held in the 16th century, forbade the use of the unicorn as a symbol of Christ. One legend they cited was from Leonardo da Vinci’s Bestiary, in which the artist made the unicorn a symbol of lust. The unicorn’s horn was thought to have magic curative powers; many late medieval monasteries and cathedrals were believed to possess them, and they appear in inventories of Queen Elizabeth I and other monarchs of the period. Powders purporting to be made from crushed unicorn horns were sold by apothecaries.